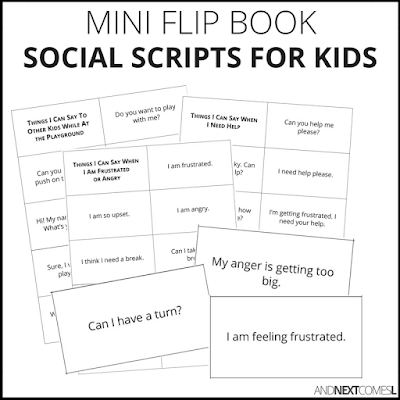 Looking for free social skills scripts for kids? 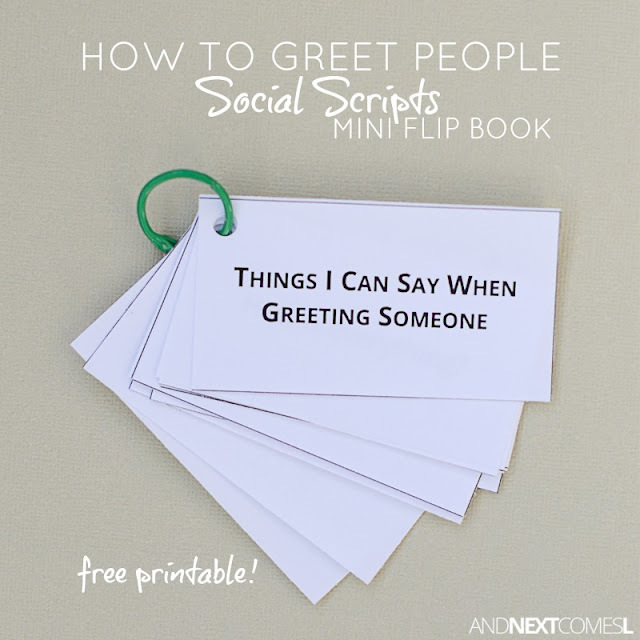 This printable social story script teaches kids with autism or hyperlexia what to say when greeting people. Due to J's hyperlexia, greeting people was particularly challenging when he was younger. Besides the obvious struggles with WH questions like "what's your name?" or "how old are you? ", he often responded inappropriately or with something that made no sense in the context. I had to guide him with verbal prompts like "you can say hello back" or "you can tell her your name is J." This free printable greeting people social scripts mini flip book is something that I would have loved to have had in my purse while shopping when he was younger. But, then again, I didn't even know what hyperlexia was at that point. This social skills scripts mini flip book gives appropriate prompts for kids with autism or hyperlexia to say when greeting people. It's small in size, so it can fit in the palm of your hand or be tossed in a bag for on the go. Or you could even clip it to your child's belt loops so that it is handy at all times. Kids with hyperlexia and autism often say awkward or inappropriate things when greeting people and might need guidance when trying to say hi to others. Scripts, like these, can help them learn what to say and what not to say. 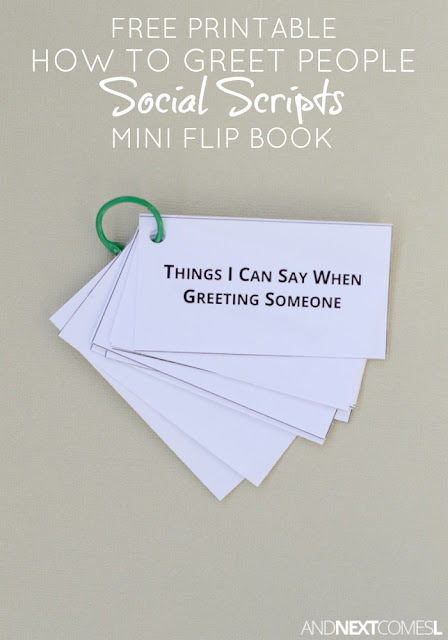 That's why I have created these mini social scripts flip books! They're like text only mini social stories to take on the go! The scripts are just there to help your kid choose an appropriate question or response to say when greeting people, either those they know or those they don't know. Use these scripts ahead of time to practice and role play so that they will learn to express themselves when the time is right. With time, you can hopefully phase the scripts out. 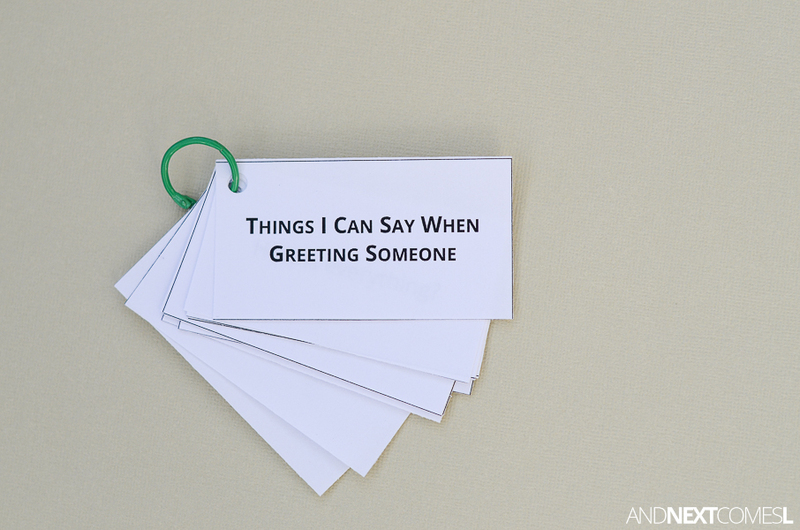 This printable is two pages long and includes 20 cards. It also has six blank cards so that you can write your own to include in the mini flip book.